Everybody seems so loud right now . It’s a good time to remember how “quiet leadership” can be effective. Here is a good reminder of it. Love this! Enjoy! Scott Cochrane has been developing a list of overlooked traits he sees in great leaders and employees. These include small things like being prepared and early for meetings, showing gratitude and interest in others, and giving respect to all regardless of status. Be Clear. Have your facts ready and know what you want to say and ask for. Stay objective and stick to the subject.. One of the ways negative people maintain their power is that they say things that surprise and sting. As with most human behavior, once we analyze the situation, we realize that there are patterns, and we can plan for them. When less surprised, we can keep our balance. Use the power of Conversation. “The conversation IS the relationship.” (Susan Scott, Fierce Conversations).- Sometimes it helps to have a “heart to heart”conversation with this type of person and let them know how much their behavior impacts us. We just need to remember that it may not change their behavior (in the long run) but we have drawn a line in the sand and articulated out loud how much it means to us. The truth is powerful. Count to 10 before responding when tension is high. (This includes email.) Don’t press “send” when you are upset! And keep emotions out of email. And walk away and breathe before responding when they say something particularly ridiculous. Conjure up your Courage to do the right things and say the truth. Speaking the truth about this type of situation sometimes means we need to take it higher –to our boss, the person’s boss, to HR. This type of person can cast a dark pall over a work group, and it is our responsibility as leaders to advocate for a healthy culture. Create an image in your mind of this person that increases your empathy. Remember that they have a mother. They were a kid once, too, etc. And remember that negativity is often rooted in pain, fear, and powerlessness. Cushion the relationship with diversions: food works well. So do stories, art, and laughter. Keeping it light is really important here, and showing others that there are way more important things than swimming in these negative waters. Bring in bagels, go for a walk, get people to tell jokes. It can be a great counter-weight. Know how to use your Charm. When we walk in our own power and truth, and foster the great relationships we can build with our team and peers, our light outshines frustration and negativity. Remember to remind yourself of your strengths and gifts, and walk down the hall with them on display! Good luck! Did you ever notice that periodically a topic will keep coming up in conversations, or you’ll read something about it and then at totally unrelated events people bring it up? Well, that has been happening with me lately regarding Delegation – several clients have asked for resources, a Management Training series which is being presented by one of my client organizations just focused on it, and several people have talked about how hard it is to delegate. So here is a good article that I give to clients that has great techniques and reminders. I tell my Leadership Clients that their compass should be that they delegate 90% of tasks (initially they look at me like I have 3 eyes when I tell them this but gradually they understand what I mean). Hope you find this helpful! Mentoring women has been shown to be a key element in the success of women in the workplace, providing advice, support, guidance and access to networks to women at various stages of their careers. I had the privilege this week of hearing Jada Grandy’s eloquent and impassioned keynote speech on the importance of mentoring at the Robert Morris University Women and Transformational Leadership Symposium. Jada is a Senior Vice President & Regional CRA Strategies Director of Fifth Third Bank. I felt honored as she acknowledged me as one of her mentors. Jada spoke of some of the key ways in which her various mentors have helped her in her life and career, which are often a part of the mentoring relationship: professionalism, integrity, image, advocacy, communication, work life “integration,” negotiation skills and networking. 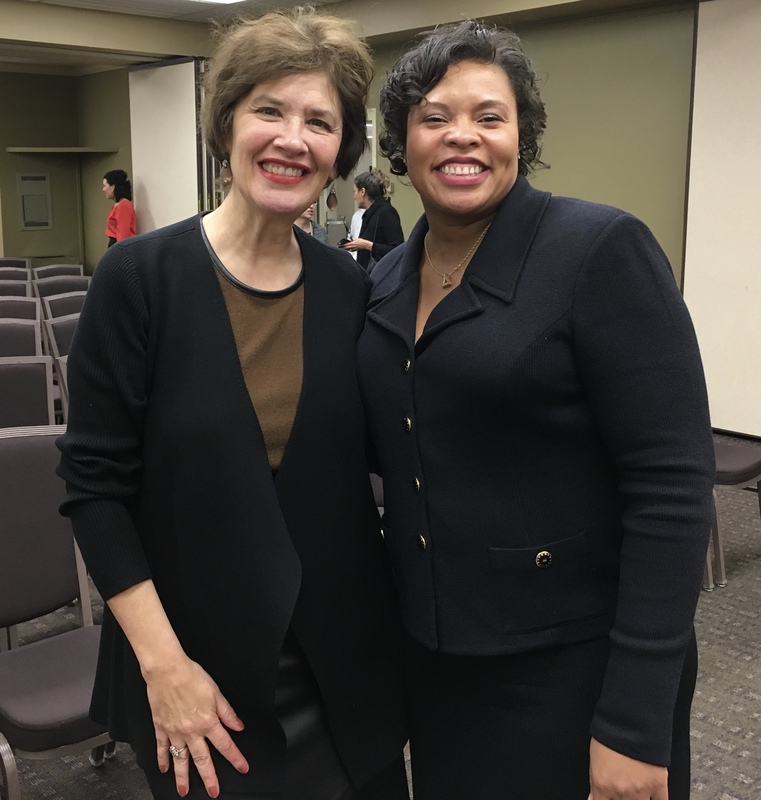 She encouraged the college students in the audience to seek out mentors, and passionately requested professionals in the audience to volunteer as a mentor. Programs like the ones at Robert Morris U. provide the structure and resources to assure the success, stability and continuation of mentoring relationships. I’ll be exploring mentoring in future posts!